적천사괘불은 머리에 보관을 쓰고 오른 어깨로 비켜 올려 연꽃가지를 들고 서 있는 보살 형태의 독존도 형식 그림으로, 다른 인물이나 배경을 전혀 표현하지 않은 단순한 구성을 보이고 있다. 보관(寶冠)은 중앙에 5구의 화불(化佛)을 안치하고 그 앞쪽 좌우에 걸쳐 금박 처리한 봉황장식을 두었으며, 신체는 머리에 큼직한 관을 쓰고 어깨를 넓게 표현하여 다소 둔중해 보이지만, 타원형을 이루는 얼굴은 눈·코·입을 단정하게 그려 넣어 우아함이 느껴진다. 색채는 주홍과 녹색을 주조로 하여 화사한 연분홍색과 옅은 청색, 양록 계통의 연녹색을 사용함으로써 갸름한 형태의 얼굴과 함께 화면 전반에 걸쳐 밝고 명랑한 느낌을 준다. 또한 그림 하단에 화기가 남아 있어 그림이 강희 34년(1695)에 조성되었고, 화원으로는 상린(尙鱗) · 해웅(海雄) · 지영(智英) · 성종(聖宗) · 상명(尙明) 등이 참여하였음을 알 수 있다. 아울러 이 괘불을 걸기 위한 괘불대 지주는 대웅전 앞에 석조로 한쌍이 서 있는데, 강희 40년(1701)에 거사 경순(敬順) 등이 참여하여 만들었음을 알려주는 명문이 있다. 이 자료들은 17세기 말 괘불 및 괘불을 거는 지주의 모습을 알려 주는 좋은 자료가 된다. 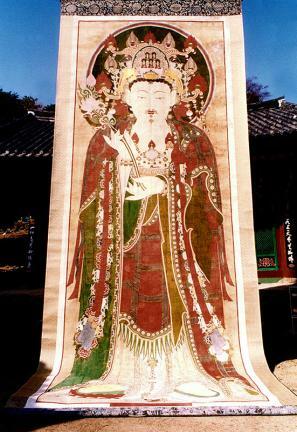 This hanging Buddhist painting, enshrined in Jeokcheonsa Temple, is in the style of a dokjondo (painting of a single Buddhist figure). It is simple in composition, consisting of no more than the main Bodhisattva standing alone, with no other figures or scenery depicted in the background. The Bodhisattva is wearing a large jeweled crown, and holds a lotus flower over his right shoulder. Five hwabul (incarnations of Buddha) are depicted in the center of the crown, with two phoenixes decorated in gold leaf to the right and left. The large crown on the head and the Bodhisattva’s broad shoulders convey a heavy feeling, but the oval face and small features add a touch of elegance. The predominant colors used in the painting are scarlet and green, together with soft pink, light blue and lime-green, giving the picture a bright, vibrant tone along with the slim-looking oval face. According to the inscription at the bottom of the painting, it was produced in 1695 (the 34th year of the reign of King Kangxi of the Qing Dynasty, China) by court artists Sangnin, Haeung, Jiyeong, Seongjong and Sangmyeong. 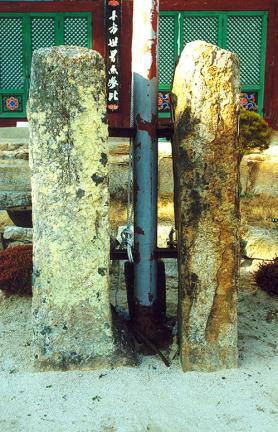 In addition, a pair of stone flagpole supports for hanging the Buddhist painting stand on the ground in front of Daeungjeon Hall. 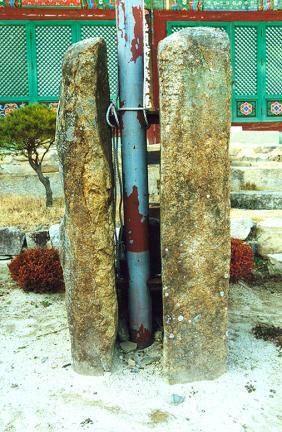 According to the inscription, the supports were erected in 1701 (the 40th year of the reign of King Kangxi) by Buddhist Monk Gyeongsun and others. Both the painting and the flagpole supports are invaluable materials for the study of Buddhist paintings and Buddhist flagpole supports during the late 17th century.